With morning rain having cleared, dry roads and clear skies greeted competitors for Friday evening's practice session at the 2015 Isle of Man TT Races fuelled by Monster Energy, but increasing winds would be problematical throughout the evening. The paddock was already aware that Clerk of the Course Gary Thompson had announced a change to the proposed race schedule with Saturday's RST Superbike moving to Sunday due to a near gale forecast for the Isle of Man. The F2 sidecars to go away first and, as with previous sessions, the outfits left the line in numerical order with Dave Molyneux/Ben Binns, Conrad Harrison/Mike Aylott, Ben and Tom Birchall, Tim Reeves/Patrick Farrance and John Holden/Dan Sayle the first five crews to head towards Bray Hill. Molyneux led the lap all the way round and was first across the line at 113.12 with Harrison next quickest at 111.96. Holden went to the top of the leaderboard with a speed of 113.22 but pulled in immediately to make adjustments to his suspension. Reeves had a slow lap at 104.91 but the Birchalls fared even worse at 90.65 and clearly had problems. Gary Bryan/Jamie Winn and Karl Bennett/Lee Cain posted almost identical times at 109.58 and 109.55 respectively, the former reporting blustery winds over the Mountain. Molyneux continued straight through for a second lap and went quickest at 114.687, just a whisker outside Holden's fastest lap of the week set on Thursday. Reeves, who was running in an engine in on his first lap, posted a speed of 113.30 with Gary Knight/Jason Crowe (109.16) and Tony Baker/Fiona Baker-Milligan (108.57) also showing well. Holden failed to go quicker on his second lap but Knight continued for a third lap and improved again to 109.67. 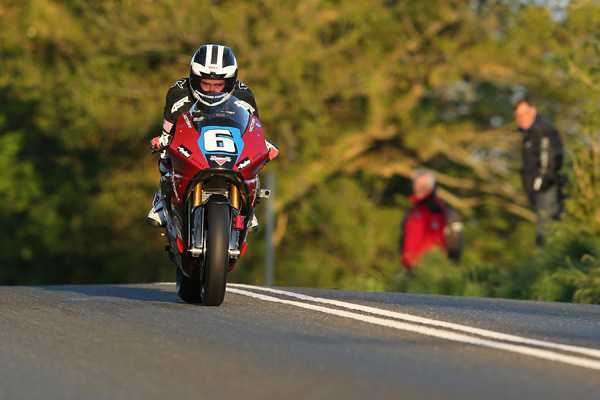 At 7.22pm, it was the turn of the Supersport and Lightweight machines with Lee Johnston, Ian Hutchinson, Keith Amor, Conor Cummins, Michael Rutter, Gary Johnon, William Dunlop and John McGuinness the first to leave the line. All were 600cc mounted with the exception of Rutter who was again out on the Paton. Hutchinson was first back at 123.13 followed by Johnston on 119.85 and Johnson 117.49. McGuinness went quickest briefly with a speed of 123.99 but that fellow Honda rider Anstey bettered that with 124.36. Speeds fluctuated though with William and Michael Dunlop and Dan Kneen all in the 115-117mph bracket. James Hillier was the quickest Lightweight at 113.74 as Rutter pulled in with a broken steering damper but Jamie Hamilton's second lap of 115.74 sent him top. Second time around for the 600s and speeds were up too as Hutchinson improved to 124.92. It was close at the top of the leaderboard though with McGuinness, the two Dunlops and Dean Harrison all breaking the 124mph mark. The 1000cc machines were let out on the Mountain Course shortly after 8pm with Martin Jessopp away first on the Riders BMW soon followed by Guy Martin (Tyco BMW), Hutchinson (PBM Kawasaki) and William Dunlop (Tyco BMW). Martin was first back at 127.861 with Michael Dunlop's opening lap on the BMW Superbike only slightly slower at 127.755. However, Bruce Anstey again showed his race winning credentials with a speed of 129.394 to jump to the top of the leaderboard. No one managed to get close to Anstey's lap second time around although Dan Kneen did improve to almost 126mph. One man who did get over the 126mph mark was Dean Harrison who's lap of 126.59 made him the quickest Superstock on the night. Gary Johnson was out of luck though pulling in on the exit of Ballaugh village. At the end of the evening a few of the Zero machines also had their first outing ahead of Wednesday's SES TT Zero with lap record holder John McGuinness showing the form that saw him triumph in last year's race with a lap of 113mph although his Mugen Shinden teammate Bruce Anstey broke down. The Victory Racing pair of William Dunlop and Lee Johnston both posted hugely impressive debut laps of 105.185 and 104.185 respectively. Dave Molyneux and Ben Binns during Friday practice.